It may seem narcissistic to do a post about design that is on my own website — and I am not doing it with any intent to be so. However, I do want to review the template and how it results in the design you see here today. First I want to talk about the “how” of this site before I get to the “what”. I started out in technology by first doing web and graphic design. A case of a hobby turning into a bit of side income. As such, I have continued to build and host my own websites for quite some time. This specific website is hosted on 1and1 and it is build on the WordPress blog solution. I have also been a follower of Elegant Themes for quite some time. Their new Divi theme caught my eye and I decided it was time to update my website as the overall design was getting dated and the content was losing focus — it became a dumping ground for many topics. Divi is not simply a template, however. I would call Divi a platform in itself on-top of the WordPress back-end platform. Why would I say this? It is a very dynamic template. Out of the box, it really doesn’t do anything but give you a blank canvas to work with. For the creatives, this is exactly what you may want. For those that are looking for a simple “install and go” plugin, this may see as if you have little or no direction on where to go next. 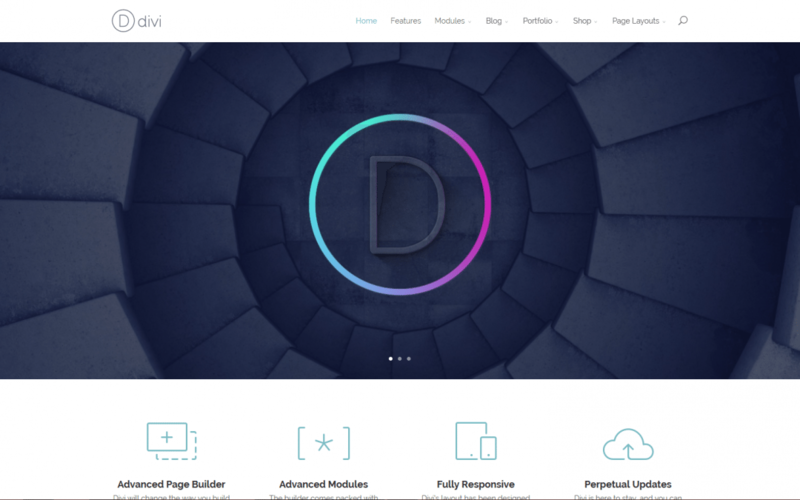 Divi supplies a very robust way to build highly interactive page elements through modules. Modules that can be configured in many layouts and designs. This is where you need to take more time to design the user experience in advance. Perhaps more time than you are used to with WordPress and templates that guide the overall user experience for you in advance. Fortunately, there are many video tutorials posted by Elegant Themes to get you started. I spent much time here as well as looking at other Divi websites and learning how to mimic their user interface. After the learning curve, you can begin to appreciate the power of this template platform. It is of course, not perfect. The robust and well designed modules are great, but to customize these it takes CSS coding ability. For many web designers this is par for the course if you are very picky about the look and feel you are trying to achieve. I am very picky about look, feel, and user experience — so I did have to use CSS in a few areas. There are some limitations to user experience — for example how buttons are positioned and look. Fortunately, there are ways to make the Divi modules work with what you are trying to do with the use of images and custom linking. With a few things I may have done differently in terms of having more options to customize the layout experiences with the modules, overall it is the most amazing theme I have ever used for WordPress. This website was created over a weekend and I feel as if I just scratched the surface of the template. I will be setting up a site to experiment and the features I like best will find their way to this website in the future. It truly is an agile platform to allow for constant website development and changes to design without installing all new templates. I really love this and highly recommend it.